Telford & Wrekin Council’s popular ‘Kids for £1’ programme of activities is returning for the February half term holiday. In partnership with RICOH UK Products Ltd, we are offering selected holiday activities to children and young people who have a Telford Loyalty Card (TLC) for just £1 each. There is a whole host of different activities for all abilities, tastes and ages, ranging from BMX, cheerleading and trampolining to gymnastics. The holiday skateathon sessions will take place from 10.30am every day granting customers up to 5 hours of public skating time for one great price. 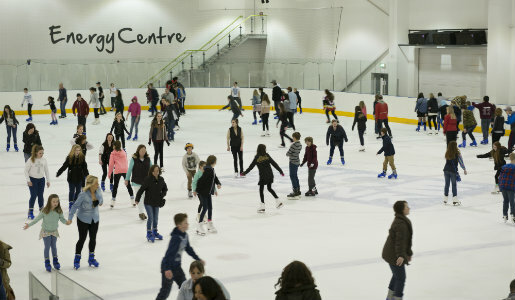 Telford Ice Rink will also play host to a Valentine’s disco this Friday and Saturday. ‘Kids for £1’ activities also include adrenaline packed session of Tubing at Telford Snowboard and Ski Centre or Pay and Play Table Tennis at Oakengates Leisure Centre. Intensive courses in Swimming, skiing and ice skating will also be on offer over the week providing the opportunity to learn and improve skills. A brand new addition to the programme is the ‘Cooking Bus’ which invites children aged 8-11 years old to jump aboard and learn how to make sweet and savoury pancakes in preparation for Pancake Day. The ‘Cooking Bus’ pulls up on Wednesday 22 February for 5 (one hour-long) sessions.